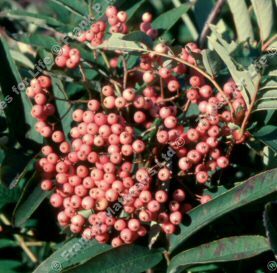 Leonard Messel (Sorbus 'Leonard Messel') is a superb small oval-shaped Mountain Ash or Rowan tree with upright branches. The winter buds are red and the leaves unusually large with many leaflets achieving excellent autumn colours. Distinctive, attractive, bright pink fruits hang in large clusters. This tree is supplied at a height of 125 - 200cm in a 7 - 12 litre container for year round planting and better results than from either bare-root or root-balled stock.